Ready for Christmas, originally uploaded by Craftydiddl. HI you guys-i just wanted to let you know that things maybe be a bit quiet around here for a week or so-i know your probably thinking -You have already been pretty quiet-but just as i was hoping to start posting FO’s and showing my baking of cookies i was hit with a sudden eye problem. A huge surprise i wasn’t expecting. I have a Horseshoe tear and some retinal detachment in my right eye and yesterday i had some lasering and cryotherapy(freezing area where the tear is) done and on Monday they will look if all is fixed-if not then i will have to have a operation done on my eye next week. I am supposed to take it very easy and limit my reading and knitting, bending anything where my head would be down alot. So, there won’t be anymore posting or reading of blogs for a little while. I will update you guys on Monday though. 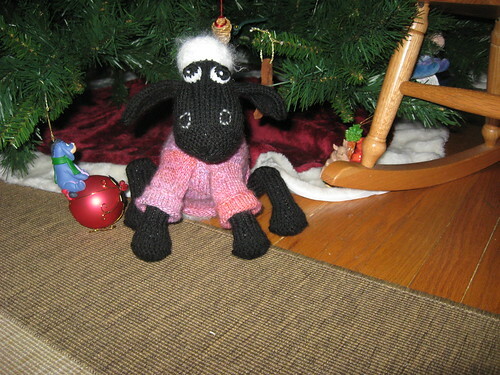 And i was able to finish Shaun the Sheep in time for Christmas but i think that’s all i will get done-everyone else will be getting their gifts late i think. i will post details and better pics when i have the okay to be on longer from the doctor. Rest and relax. Don’t worry about anything. Let that eye heal. I’ll keep you in my thoughts.